Mats are one of the most universal tools that a person can have in their homes. They can act as welcome mats at the front door, as a cushioned mat to ease pressure on your joints when standing in one place for extended periods of time or as a floor covering in a garage or basement just to name a few. Mats have been known to find their way into bathrooms and even in front of the grill on a deck. Because of all their wide uses mats and welcome mats have become one of the common day items that is trampled on daily, but very rarely remembered, maintained or replaced. Because of their wide versatility some people find it very difficult to pick out the right mat for their needs and tastes. Because of this one of the first two questions I always ask customers when they inquire about what kind of mat they should get is, "what are you going to be using it for and where are you going to put it?" These two very simple questions can vary the answer that I will give in a multitude of ways. Perhaps they want something to grace their front stoop, then it might be suggested that they get a Sports Mat or Seasonal Mat depending on their tastes and what impression Maybe they want to make at their front door. 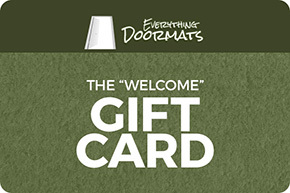 Maybe they wanted to dress up their front door with a little style and so they might want to get a textured mat, a river rock mat or a personalized entry mat to let everyone know whose home they are entering. People express many things with a Welcome mat, and some even will use humorous door mats to lighten the hearts of any and all visitors. When they ask about interior use mats, they are typically looking for a mat to catch dirt and water. This typically means that they are interested in or need a utility mat or one of many rubber backed mats. Both types of mats are extremely easy to clean and maintain and help trap dirt, debris and water. By simply vacuuming over them or shaking them out every once in a while they will continue to look great for a long time to come and will protect the floors throughout their home. Finally when people ask for additional information about our mats I often direct them towards the page you are reading or our blog page http://diyweekly.com. Although not only about our products, we offer a wide range of Do It Yourself advice and articles. Our Blog will sometimes feature one of our mats but we primarily focus on offering a wide selection of DIY ideas and post. To this end we hired an extremely competent â€œDo It Yourselferâ€ who has a ton of experience in that area. Our Blog master is a long time Michaels Arts and Crafts Manager with years of experience in doing things herself and helping others to get their projects up and going. When she does highlight one of our mats we also have her devote some time the various ways that they can be used. Occasionally we announce news, events and sales on the blog but the blog mainly focuses on promoting DIY ideas and articles. Visit our blog today and see some of our DIY Expertâ€™s most recent ideas and check out some of the products that she has already highlighted. Here's wishing everyone a happy and beautiful home.